Turn Master Books' Investigate the Possibilities series into a homeschool science curriculum with this convenient lesson planner. 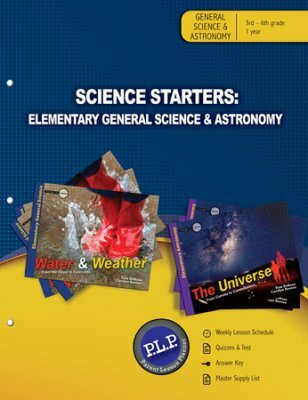 Covering 36 weeks of instruction for Investigate the Possibilities: The Universe and Investigate the Possibilities: Water & Weather (both sold separately), a weekly lesson schedule, student worksheets, quizzes & tests, and an answer key are provided. Pages are grouped by type, rather than by lesson, so parents can easily remove tests and answer keys. Worksheets and tests include vocabulary to define, short answer questions, Bible-based questions, and activities; the book page numbers and day number are on the top of the worksheets for easy assignment tracking. By reading Water and Weather, students will explore weather and water from a biblical perspective and learn about zones in the ocean, the weather cycle, weather instruments, the connection between water and fossils, and more. The Universe portion of the lesson planner explores the discoveries of scientists in history, the creation of the telescope, and the history of flight. This course covers 1 year of science at the recommended schedule of 30-45 minutes per lesson, 3 days a week. One book completed per semester is suggested. Reproducible for homeschool families and small classrooms with under 10 students. Line-listed answer keys. Glossary included. NKJV Scripture used. Grades 3-8. Softcover. 92 perforated, three-hole-punched pages.